Oránj Climax - "e-Noise" / "e-Noise too..." / "Sahara"
Though these three releases are all from 1998, New York based Or'anj Climax has been playing improvised electronic music for over ten years. The trio includes Charles DeLozier on synths and drums, John Pichardo on synths and sequencing, and Escapade member John Ortega on synths and percussion..
"e-Noise", though displayed as one 63 minute track in the CD player is a compilation of excerpts from various improvs edited together. This is electronica that includes looped effects, occasional real melodies, and a continuous parade of sounds. An interesting mixture. A simple repetitive bit will be playing accompanied by a completely different repeating bit, both against flowing synths. The result is pleasant and the musicians' combined efforts produce music that is often dreamy and always busy. Like a more freewheeling and varied version of Tangerine Dream. But it's the banquet of sounds and varied layers of activity by the musicians that elevates this from standard floating electronica to being a far more active experience for the listener. "e-Noise too" seems to focus more on pure atmosphere than the first and, as one full length improvisational piece, is much slower in its development. (An orchestral mellotron sound early on grabbed my attention.) The disc continues through numerous themes that feature the musicians experimenting with sounds, patterns, and textures. Overall, however, I think this disc would work better as several separate tracks rather than an entire work. I found the first "e-Noise" far easier to listen to in one sitting than this one, which feels more like a random collage of good ideas than a coherent work. 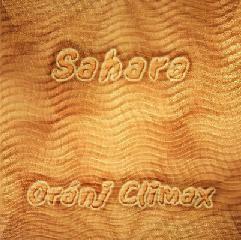 "Sahara" is another full length piece, this time a more comfortable 43 minutes. Coherence is the big challenge for improvised music and "Sahara" accomplishes what seems to be lacking on "e-Noise too". The music develops smoothly and I wouldn't have guessed it was improvised. In addition, the band must have been pretty fired up on this day as the music has an intensity that isn't present on either of the "e-Noise" discs. The music is even more reminiscent of early Tangerine Dream or electronic Ash Ra Tempel, but we're also treated to a good bit of the varied sound explorations that I found enjoyable on the first "e-Noise". Also, the music is more percussion heavy than the "e-Noise" discs and here serves to add to the atmosphere's intensity, and so the tribal beat commanded even more of my attention. In summary, Oránj Climax would appeal to fans of ambient electronica who have had trouble finding something a little more interesting then the standard stuff. Having immersed myself in the improvisational band Escapade's music for this issue's interview it was also interesting to be able to explore a very different improv project of John Ortega's as well. 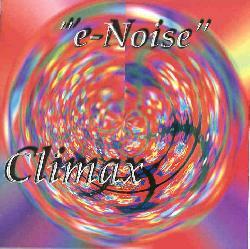 Start with the first "e-Noise" or "Sahara". For more information you can email Oránj Climax at oranjic@aol.com.